RodPrjónar: My mittens history. Ready for winter now? + Hyrna Herborgar KAL: Pictures. My mittens history. Ready for winter now? + Hyrna Herborgar KAL: Pictures. As I advanced in my last post I have been working on a pair of mittens to have a full set of new "winter accessories". I haven't knitted to many mittens since I began knitting at the end of 2008. 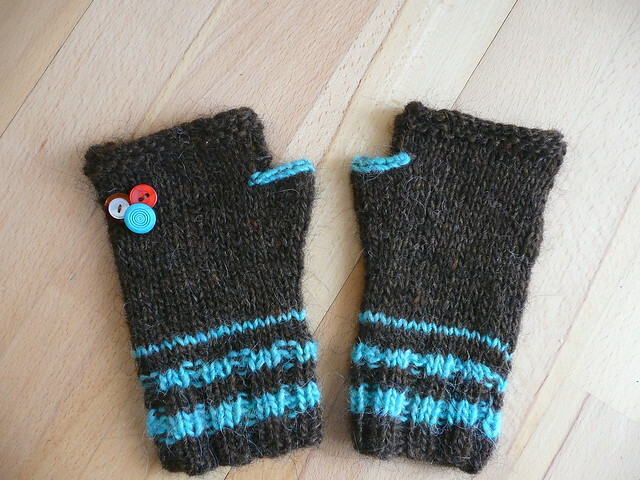 I have made only three pairs plus a pair of wristwarmers (that I made to learn how to make a gusset for the thumb). My first finished project almost three years ago was actually a pair of mittens! They came out quite ok. It wasn't so bad to be my first real project. I struggled a little bit making the decreases on top of the mittens. I think that by then I didn't even understand well how decreases slant. Then I made the wrist warmers as an exercise to learn how to make a gusset. I used pretty much the same stripe idea that I used on my first mittens. I made these ones with létt lopi on 4mm needles. The third pair I made was a Christmas present for my dear friend Kristina who really likes to take pictures. To make this ones I followed the pattern that Bea Aarebrot shares for free in her blog and added the colorwork to it. Made with Aslan Trends Del Cerro, 100% Merino on needles 3.5mm for the ribbing and 4.5 for the rest. And the third pair: I used stripes, many colors and made them with a thumb gusset. 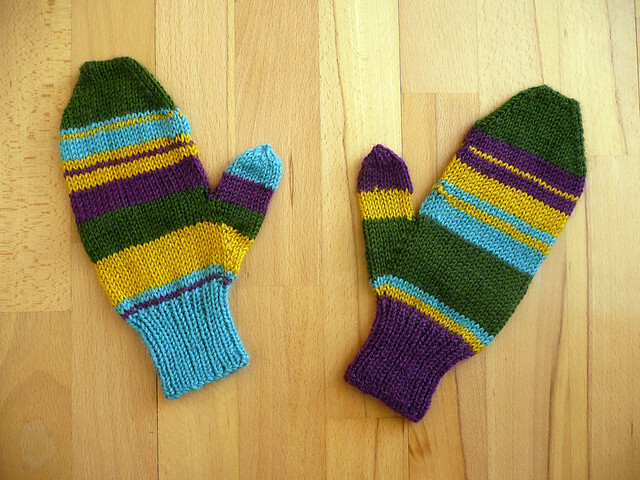 The idea was to make the mittens different from each other by using different colors and different stripes pattern. Made with Hjertegarn vital using needles 3.5 and 4.5mm. These were a present for my niece when she came to visit me. As you can probably see, I have only knitted one pair of mittens for myself. So it was already time to get a new pair. Searching on Ravelry I found a very nice pattern. I liked it so much that I casted my stitches on immediately! 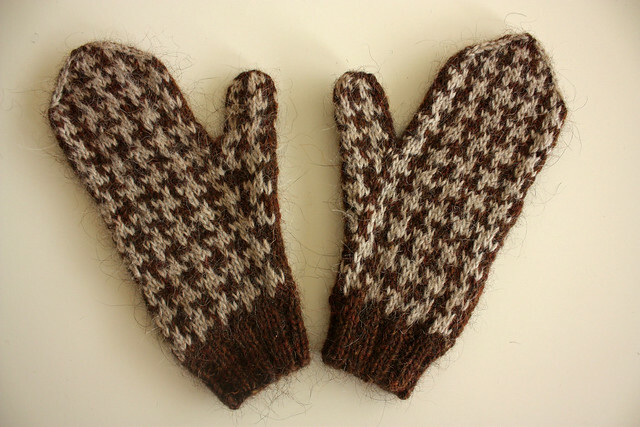 * Pattern: Houndstooth Check Mittens by Sarah H. Arnold. * Yarn: Létt lopi. One skein of each color. * Needles: 3.5mm for the ribbing and 4.5mm for the rest. * The pattern is very well written and the charts are easy to follow. * I made some changes to the pattern because I used a yarn that is bulkier than the one than the pattern calls for. * Casted on 36 stitches (instead of 40) for the ribbing and then increased 8 stitches evenly to knit the body of the mitten.So, I worked with 42 stitches (instead of 50 as the pattern calls for). 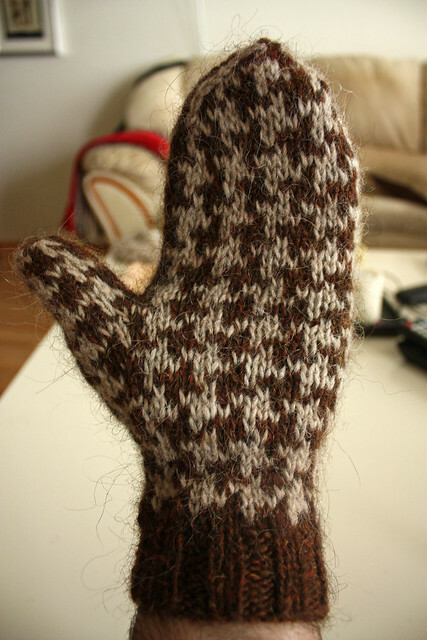 * I didn't knit the thumb gusset all the way to row 26, instead I made it shorter. I knitted it to row 21 and then put the 18 stitches in a scrap or yarn. * I began the decreases earlier that the pattern calls for because of the yarn I used. 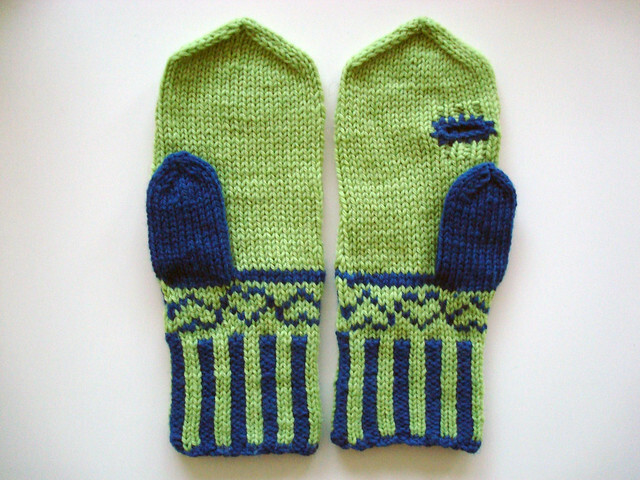 * I LOVED knitting these mittens. It was absolutely FUN. I am actually thinking about making another pair but this time using white as a contrasting color, instead of very light brown (oatmeal?). * I have always liked this kind of patterned fabric but I had NO IDEA it was called Houndstooth! It looks so classy and elegant! 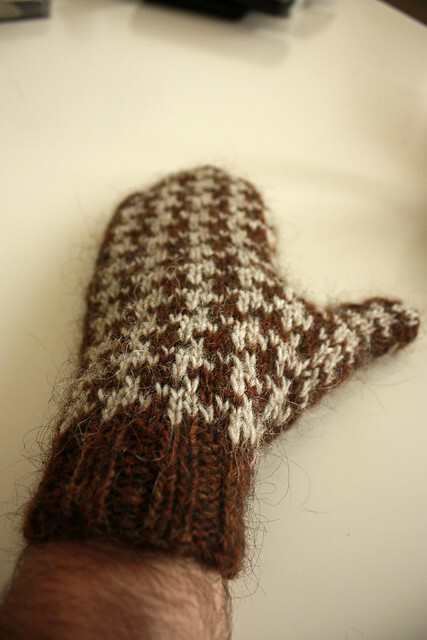 * Lopi works amazingly well for mittens. It is sturdy, somehow "all-terrain", durable and warm. * I strongly recommend this pattern. The result is very nice and SUPER warn since it is knitted using two strands of yarn all the way! Remember the KAL with Kristín Hrund, Gummi, Jóhanna and me? We met Kristín a couple of weeks ago to take the pictures. Unfortunately the light was not very good. It was very cloudy and pretty late as well. Mmmm, todos los guantes son preciosos aunque me quedo sin duda con los últimos que has tejido. Los verdes con corazones también me gustan, creo que este invierno estoy muy motivada con el fair-isle. Preciosa la última foto del Haruni y muy divertida! estoy con albis, todos son preciosos pero yo tambien me quedo con los últimos...aunque los de rayas de colores me encantan! lo reconozco. habrá que echarle un ojo a ese patrón. Mittens - about the only thing I knew how to knit when I was younger. It was the one thing we needed while growing up, so that's what my mother taught me to knit! You have been so much more creative than I was, though. I love all your stripes and the buttons sewn on the fingerless mitts. I love those colors, too. I can see why your sister wanted them. I really like Kristina's mittens, too. The colors look so nice together and I love the way you did the design. And that escape hole for her picture taking finger is perfect. How clever! I do hope your niece is not one that likes everything to "match." Love the colors. I was surprised when I scrolled down and saw the mittens you made for yourself. Houndstooth! I've alsways liked that pattern and grew up with jackets, scarves, etc.in it in black and white. I was going to say it was originally an English pattern, but thought I'd better check first and learned it originated in the Scottish Lowlands. I like the colors matching your hat and cowl and will be interested to see how they look in reverse. Two pairs of mittens is not too many for a cold, snowy winter. Cool mittens! [queuing the pattern] I love the combination of browns. Chispeantes los guantes y manoplas. No sabría cual hacer primero. La foto de la familia Hyrna ha quedado preciosa. Saludos desde las cálidas tierras del sur de Europa donde ver guantes todavía es vivido como algo exótico, como mirar una prenda muy lejos de ser usada. me morí con tanto modelo bonitooo!!!! me encantaaannn!! qué genio! están uno más lindo que otro! y los chales!! wow! preciosos, qué linda foto! I'd say making a pair of houndstooth is a bit of an overachievement (after seeing the other mittens you made), but you did it perfectly! !